With the dust very definitely settled from The Force Awakens, it does seem that people went a little crazy over Captain Phasma. She was a perfectly entertaining character, and she definitely had a cool design, but there wasn’t much more than that. Which definitely upset some people. I had no real expectations, so I wasn’t let down. I would like to see more of her in the next one, though (especially after catching up on Game of Thrones and finding out just how awesome Gwendoline Christie can be), so here’s hoping. Phasma’s gotten at least one figure in each of The Force Awakens’ many lines, with the latest being from the smaller Black Series line-up. 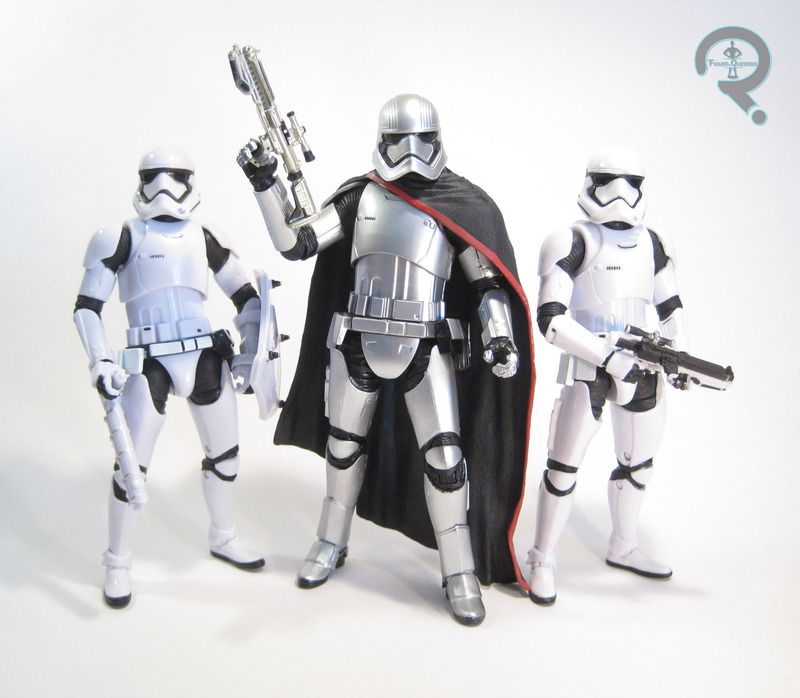 Phasma is the last of the three figures that make up the fourth series of Walmart’s exclusive 3 ¾-inch Star Wars: The Black Series. The figure stands a pretty sizeable 4 ¼ inches tall and has 26 points of articulation. Her design is quite similar to the First Order Stormtrooper, but the actual figure is a fair bit sturdier than the smaller Trooper, which is much appreciated. There’s plenty of great fine detail work (the helmet once again stands out), and the proportions are pretty nicely balanced. My only complaint is less about ther sculpt and more the way the figure was packaged: her shins are quite bowed, which makes keeping her standing quite difficult. The cape (which is a sculpted add-on) is thinner and less obstructive than the larger figure’s cape, which is good. It’s a little odd, since the aesthetics of this series so far have dictated cloth capes and such, but I can’t say I mind the sculpted piece. Like her two previous figures from Hasbro, this Phasma goes for flat silver paint, in place of the more chrome stylings of the movie. I’m still a little bummed by that, but it’s a little more acceptable on a more articulated figure such as this one. In spite of the flatter finish, the paintwork here is pretty solid. There’s a bit of bleed over on some of the black/silver changeovers, but that’s all pretty minor. Phasma is packed with her usual custom blaster, which she can hold much better than the troops she commands could hold theirs. As with Han and Leia, Phasma was purchased for me by Super Awesome Girlfriend. As with all the Phasmas I’ve looked at so far, I really like this one. I think the 6-inch one is still my favorite of the three versions, but this one’s still really solid, and I think she’s my favorite of the Series 4 figures! 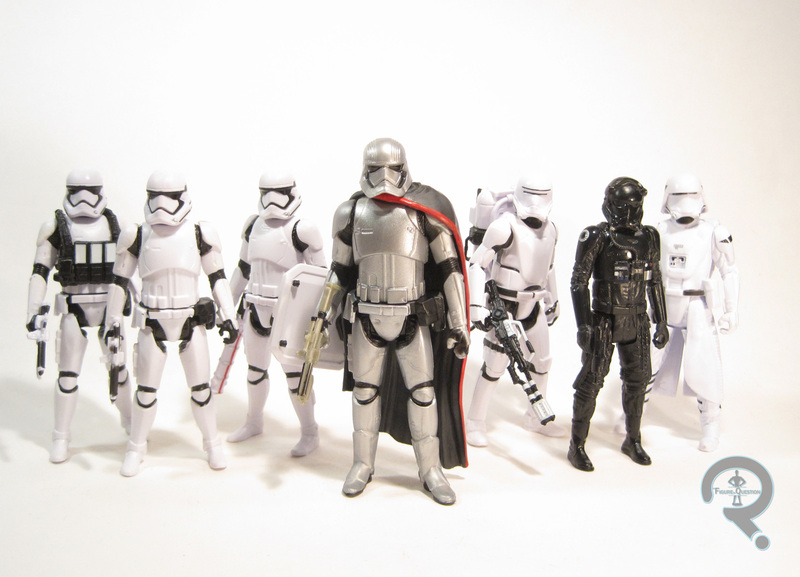 Captain Phasma is figure #06 in the Force Awakens re-branded Star Wars: The Black Series, making her numerically the first figure in the second series. The figure stands a whopping 7 ¼ inches tall and she has 24 points of articulation. Her range of motion is fairly similar to the basic First Order Stormtrooper, though she’s made a bit more limited by the slightly taller thigh armor and the addition of the cape. Granted, she wasn’t super mobile in the movie (apart from that time she got tackled by Chewbacca), so it’s not like there are a lot of scene-specific poses that she can’t pull off. The actual quality of the sculpt is pretty great; she’s pretty similar to the Stormtrooper, but with additional detailing, as well as an all-around sharper look, which makes her a pretty awesome piece. The cape, though restrictive, is very well textured, and shaped very nicely to her shoulders. The paintwork on Phasma is incredibly clean, possibly the cleanest I’ve seen on a recent The Black Series figure. The colors are all clean and distinct, and she really pops when placed with the rest of the line. The elephant in the room here is the finish of the armor: Hasbro opted for flat silver, as opposed to going the vac-metalized route. It’s understandable, as basic paint holds up a little better to play, but she does lose some of the coolness of her on-screen counterpart. 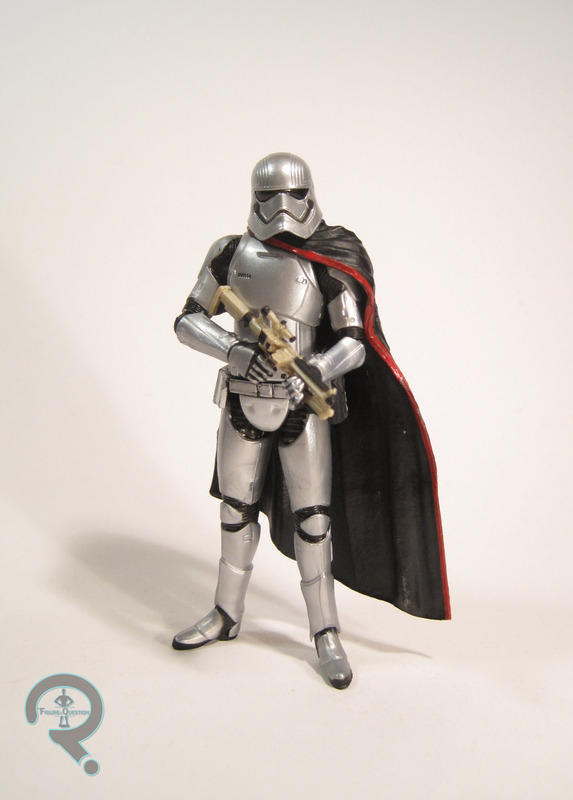 Phasma includes her custom blaster rifle, which, like all the Stormtrooper weapons, can be stowed on her right leg. 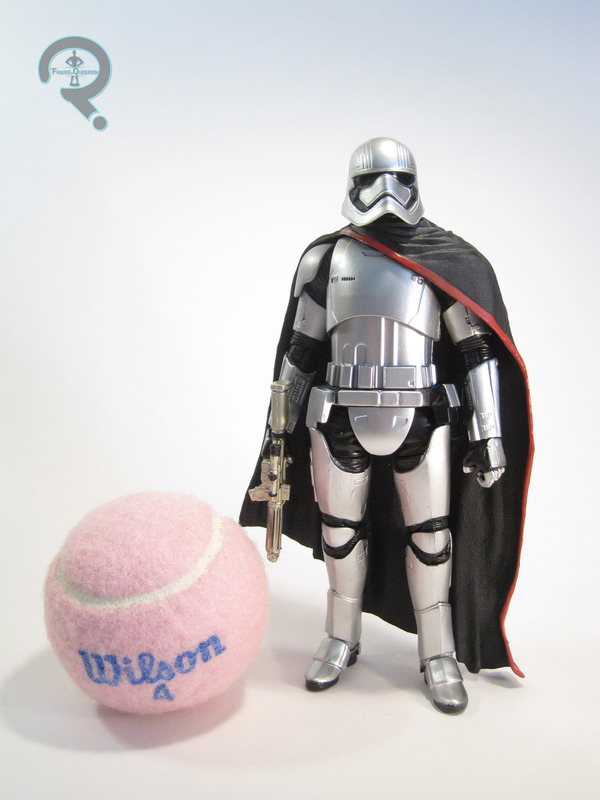 Rest assured, dear readers, I didn’t shell out the big bucks for Phasma. It would appear that Hasbro has started shipping out more cases containing Phasma figures, because I didn’t have to try particularly hard to find this one. My dad actually came across her at Target, just in with the other Black Series figures. I even saw another Phasma a few days later. I’m glad to finally have one of these. Sure, her part was relatively small, but she still has a really awesome design, and it translates really well to action figure form. That being said, I’m really glad I waited for the price to fall; at retail, she’s an entertaining figure, but for much more than that, I can see her being a disappointment. Staaaaaar Wars! Nothing but Staaaaar Wars! ….Okay, maybe not “nothing but Star Wars.” I do still have other stuff. But, the amount of Star Wars stuff getting reviewed recently compared to just how much Star Wars stuff I actually own does seem a little disproportionally large. I guess a new movie does that. So, how about some more Star Wars toys? I’ve certainly had quite a focus on many of The Force Awakens’ dashing heroes, so why don’t we have a hearty look at the other side, with this here First Order Troop set! These seven figures make up the “First Oder Legion” boxed set, which is part of the smaller-scale Star Wars: The Force Awakens line. The set is an Amazon exclusive, and, after a sizeable delay, it started shipping out in mid-January. 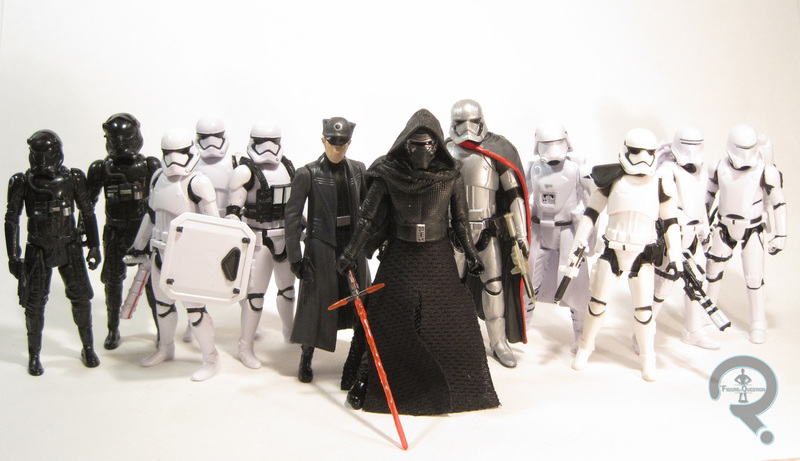 Most of the included figures are simple repacks of regular release figures, though the Heavy Trooper and Riot Control Trooper are currently exclusive. One of the biggest reasons I got this set, due to her single carded figure being virtually impossible to find. While her part in the film made me glad I hadn’t shelled out the big bucks for her, I still liked her design enough that I wanted at least one figure of her. The figure is just over 4 inches tall and has the standard 5 points of articulation. The sculpt on id pretty decently handled; the details of her armor are all nicely carried out, and the under suit has some nice texture work. 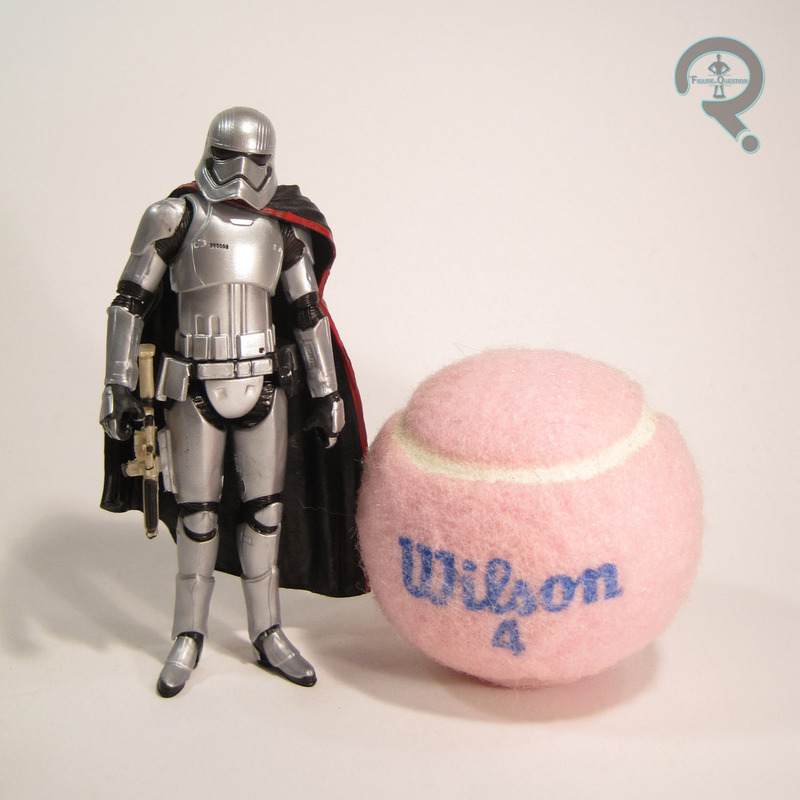 Her helmet exhibits some much finer detail work than the basic troopers, which is nice. She has just the slightest bit of a pose to her, which keeps her from having an awkward straight-up -and-down pose, without getting too extreme. The cape is a separate piece, made from a soft plastic material. I much prefer the plastic to cloth here, so I’m glad that’s the way Hasbro took it. The paintwork here is decent, but nothing to write home about. The somewhat flat silver plastic is definitely not as striking as the chrome-plated look from the film. Granted, the single release was like this too, but giving the exclusive version chrome plating would have been a nice way to incentivize this set for people who already had the single release. Oh well; she’s not that bad. 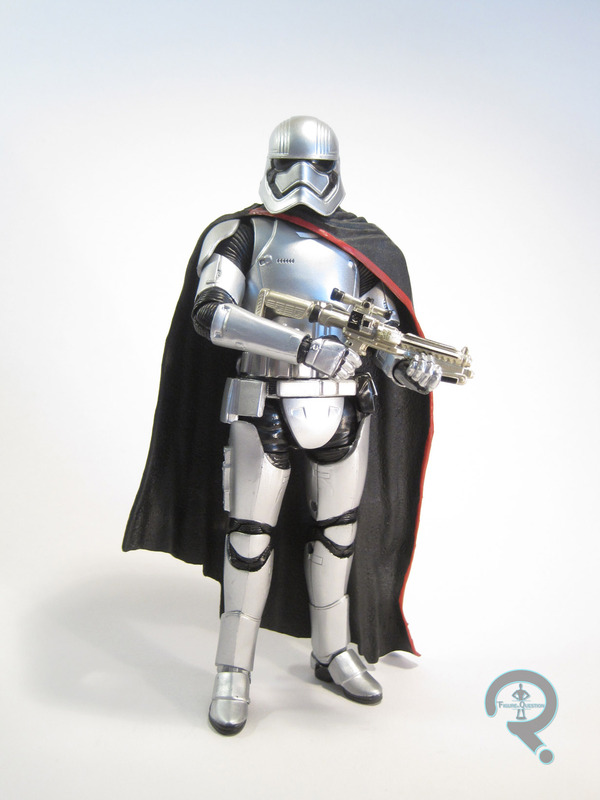 Phasma is packed with her unique, gold-colored blaster, which she can hold reasonably well in either hand. 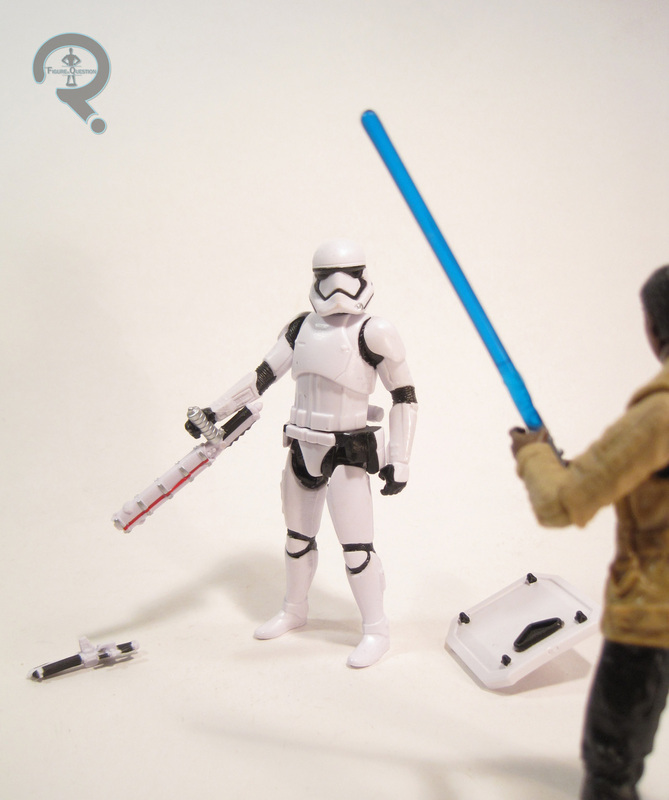 Do you remember when I reviewed the Stormtrooper Commando included with the Assault Walker? Well, then you’ve more or less seen this guy already, minus that figure’s shoulder pauldron. That’s not to say the two are identical, though. The legs are just the slightest bit wider in stance, and, most importantly, the neck pegs are the same size as the ones used for the un-helmeted characters, allowing for easy swapping, which is a definite plus. Aside from those small changes, the sculpt looks very much the same outwardly as the Commando. It’s a good translation of the film design to the smaller scale. Once again, the paint is just a fairly straightforward white plastic with black detailing deal, which looks fairly decent. The black is definitely fuzzy around a few of the edges, but not terribly so. The Trooper includes a basic mid-sized blaster, which can be stored on his thigh, like all the other troopers. This is one of the two exclusive figures in this set. 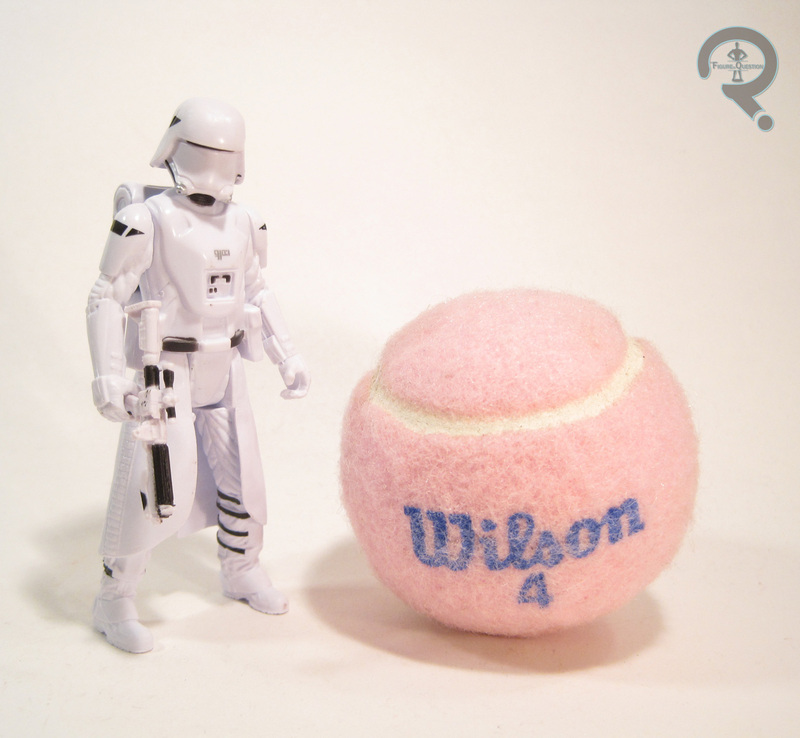 He has the notoriety of being the same class of trooper as the fan-favorite “TR-8TR” (who’s actual name was FN-2199). As far as the figure goes? 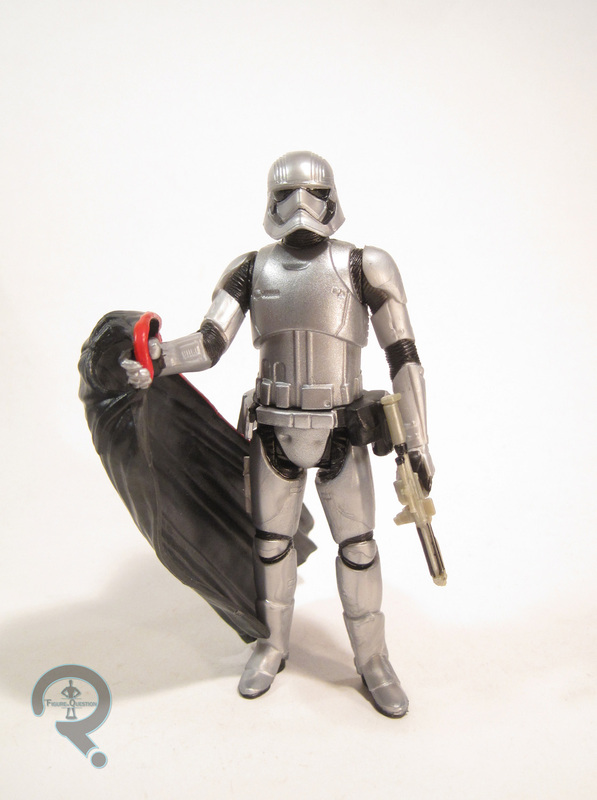 Like his larger-scale counterpart, he’s just a basic trooper, with the addition of a few new accessories. He has the same blaster as the normal trooper, but in addition to it, he has his baton and shield. Both pieces are quite nicely sculpted, and very well painted. Perhaps the only downside is that the shield isn’t quite as nicely handled on the underside as the larger version. However, it’s also a lot easier to remove, so silver lining. This figure is the other exclusive figure in this set, and is one of the major reasons I picked it up. I really like the look of the Heavy Trooper. The figure is yet another variation of the basic trooper figure. This time, he gets a unique add-on for his web-gear, which appears to hold extra ammo of some sort. It’s a bit bulkier here than in the film, but that’s to be expected, and it’s not terribly far off. In addition to the vest piece, he also gets a larger, cannon-style gun, with three pieces to help it stand. He has some trouble holding it due to the limited articulation of the figure, but he looks alright just posed standing behind it. 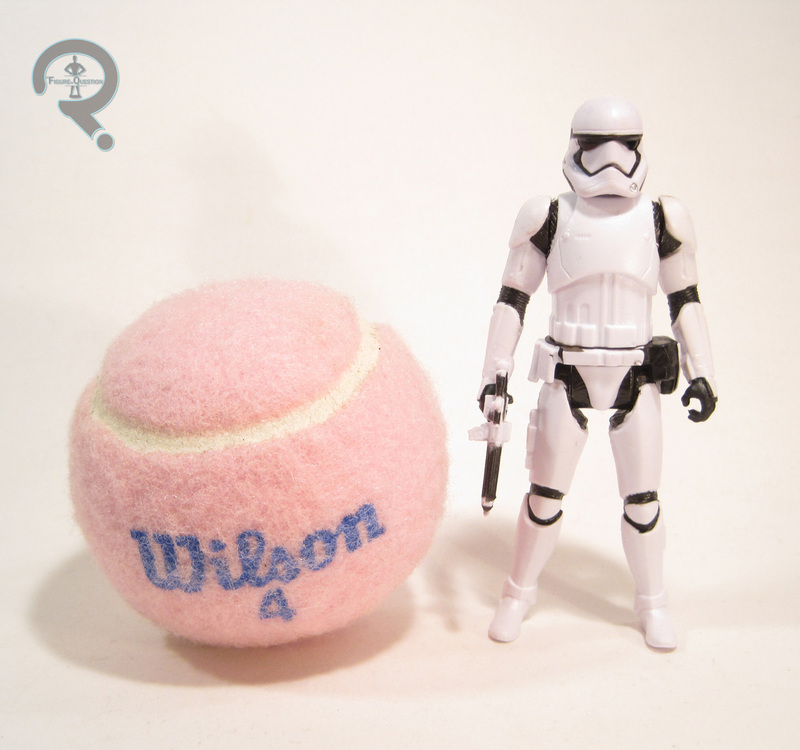 Where would the Stormtroopers be without a few environment-specific variants? The original trilogy Snowtroopers were always a fan-favorite, so it’s no surprise that that was the first really environment-specific trooper to get an update (having a climax that took place at an arctic locale probably helped too). The figure is 3 ¾ inches tall and has the usual 5 points of articulation. The sculpt does a pretty good job of translating the design into figure form. Like Hux, this figure’s “skirt” piece has been made a part of the legs, though I feel it works far better here than it did on Hux. One thing I did notice about this figure was his rather present tilt forward, which can be a little frustrating. Aside from that, the sculpt is generally very nicely done. The paintwork on this figure is pretty basic (again), but still suffers from some of those fuzzy edges. 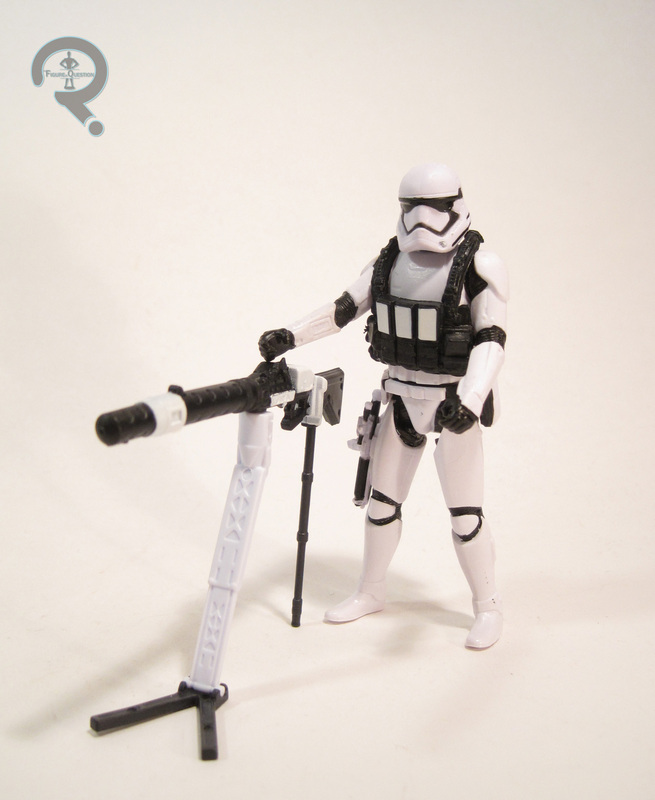 The Snowtrooper includes a removable back pack, as well as a blaster with an extended stock. Here’s the one figure in the set for whom I already owned the single-packed version. Yes, this figure is 100% identical to the regular release Flametrooper, minus the weird build-a-thing piece. Click here for my review of this figure. 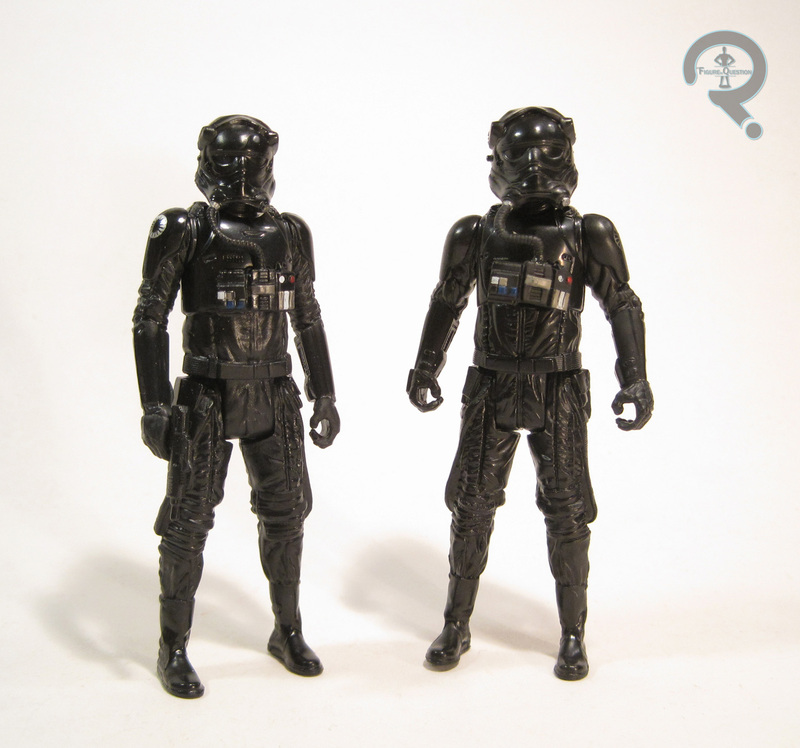 The TIE Fighter pilot included here is different than the one included with the TIE Fighter. That figure had a removable helmet. While it was a cool idea, it ended up making the figure’s head a little large. So, this figure’s permanently attached helmet actually works to its advantage, giving us a more faithful rendition of the helmet design. He also has a noticeably different set of arms, which are just a bit longer and look more relaxed and natural than the other pilot’s. The paint on this figure is pretty basic, being mostly just black, with a few smaller details here and there. The insignias and small details are particularly sharp, and add some nice pop. The TIE Fighter pilot includes a small blaster. After being disappointed by Toys R Us’ midnite opening on Force Friday, I went home and took a look at what was available online, and wound up preordering this set from Amazon. It was originally supposed to hit in late September, just after the Force Friday stuff, but it was delayed until January. I was definitely bummed, but I decided to hold out and wait for it. I’m glad I did. Not only did I finally get a Phasma figure, but I also got one of my personal favorite Troopers (the Heavy Trooper), and one of the more important Trooper variants (the Riot Control Trooper). The other figures are all pretty solid too, and add a ton of value to the set. Plus, my First Order lineup expanded pretty quickly!